you are in your familiar surroundings, don’t have to leave the house, if the weather doesn’t suit you, and you have everything you love ready at hand. One thing people, who have an actual office, like to overlook: when they go to their office, they are GONE. I, however, am HERE and that means that I – assuming I have work to do – get swamped by talkative, funny, cute-annoying teens, who chew my ear off, want to snuggle, make fun of me, sing at the top of their voices, ask me questions that I don’t know the answer to off the top of my head, ask me for money (they actually want money all the time, not only, when I have work to do), turn the music up AND sing along at the top of their voices, fall over my things that are scattered everywhere, tickle me and ask me every hour when we’ll have something to eat. 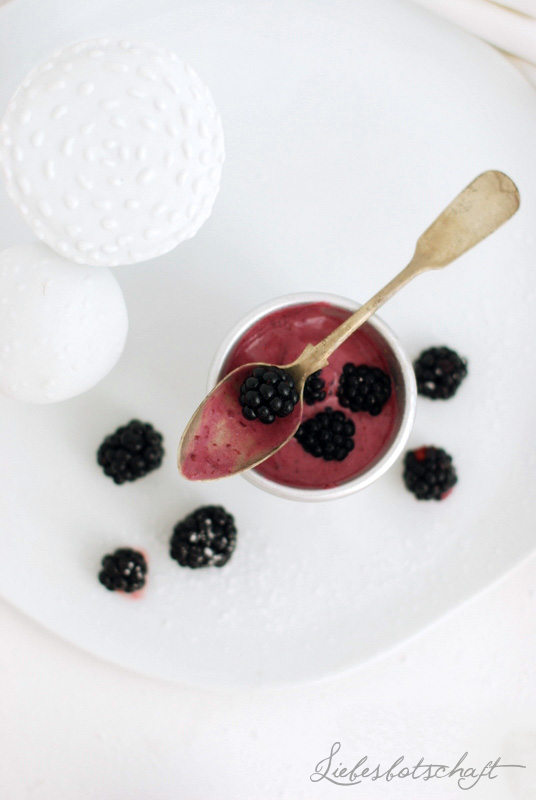 we had a wonderfully creamy blackberry mousse with Greek yogurt! 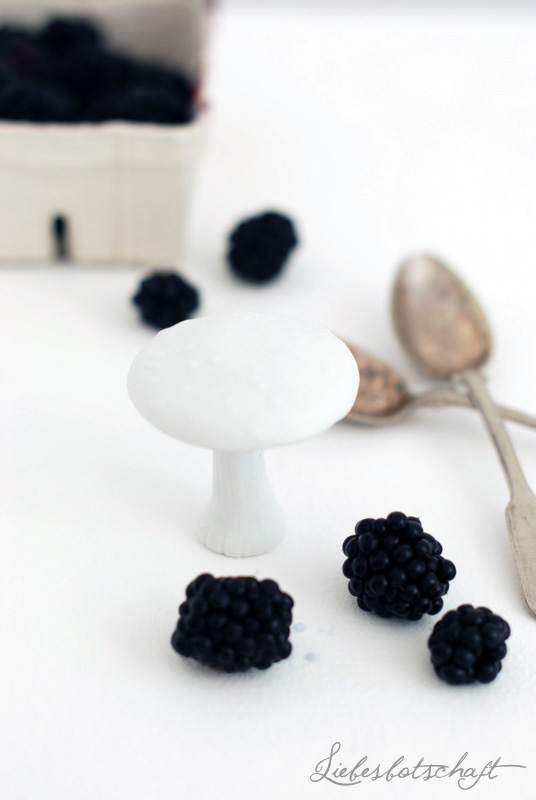 It is neither too sweet nor too tart, but exactly right and refreshing and really light. You simply have to try it – raspberry’s darker sister will not be in season for very much longer. 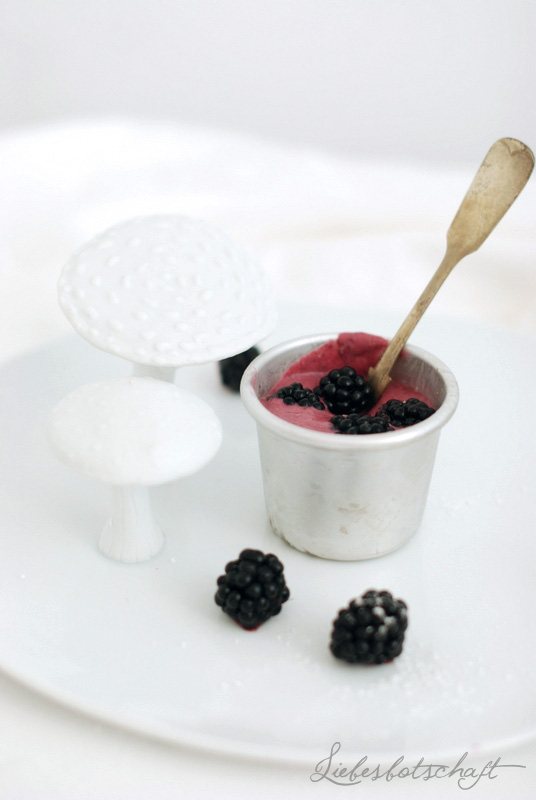 This is the ideal dessert for very warm Indian summer days like today! I served the mousse on my new plate: I just love Räder’s simple elegance so very much. It isn’t only beautiful for fall dishes, but just as appropriate to display chestnuts etc. 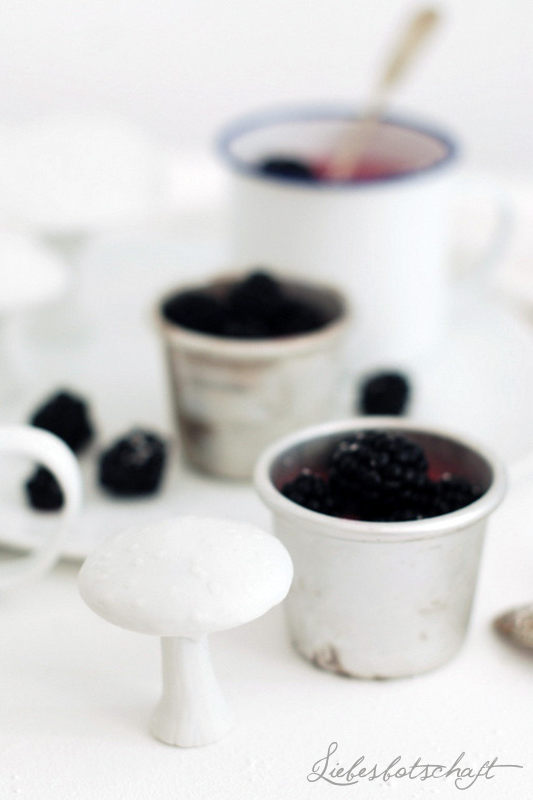 The wild boar and the single mushroom are wonderful in their roles as small eye-catchers in the fall decoration! 1. Wash blackberries and purée half of them. Thoroughly mix Greek yogurt with the purée. Whisk egg yolks and confectioner’s sugar in a bain-marie (bain-marie: heat water in a casserole and place a slightly wider bowl on top, so that the bowl sits above the hot water. The rising steam heats food in a very gently way). Stir potato starch into lemon juice (make sure to avoid lumps), then into hot egg mixture, let set briefly. Remove bowl from the bain-marie and place over a bowl with iced water so that the mixture cools off quickly. Stir Greek yogurt into the cooled egg mixture. Whip cream and fold in. 2. 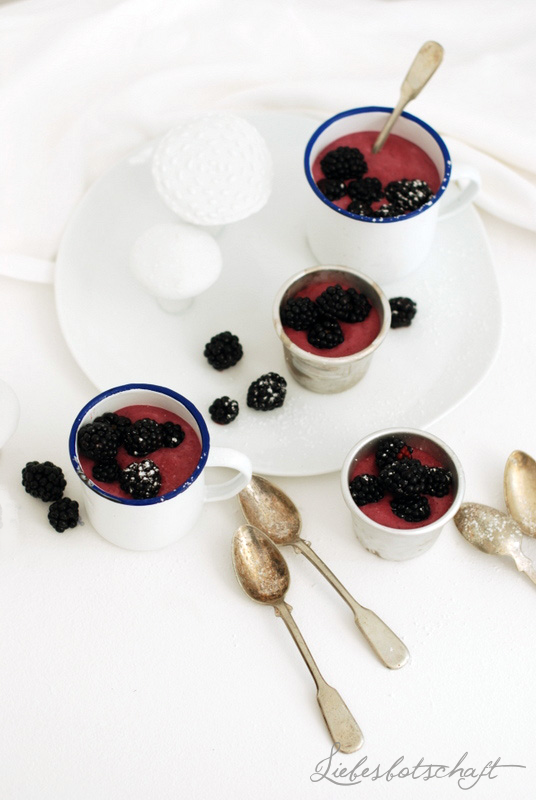 Distribute half of the remaining blackberries into glasses and top with mousse. 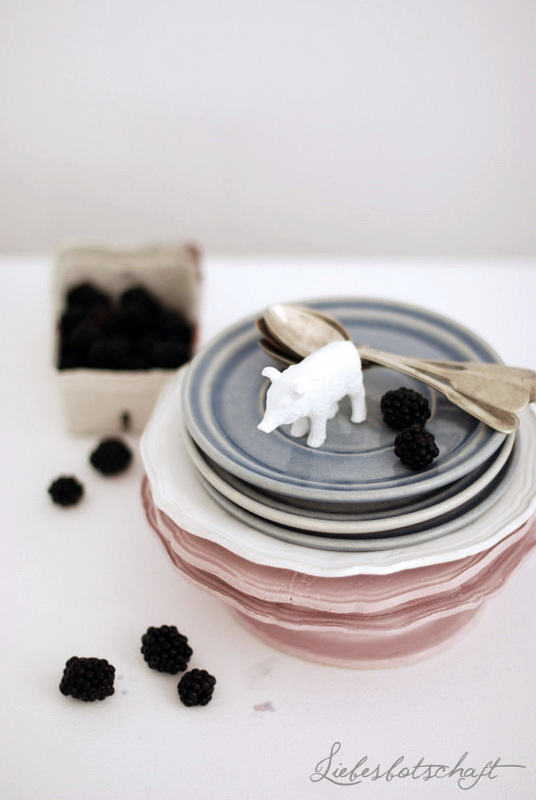 Decorate with the remaining blackberries. Hop on the couch and watch the Journey of the Beasts together. "Tomorrow" is also worth watching. And The Art of Flight (trailer HERE) is also something we could watch over and over again.